No more charging your gadgets on the go while experiencing difficulties holding your power bank, your phone, and the wires together! 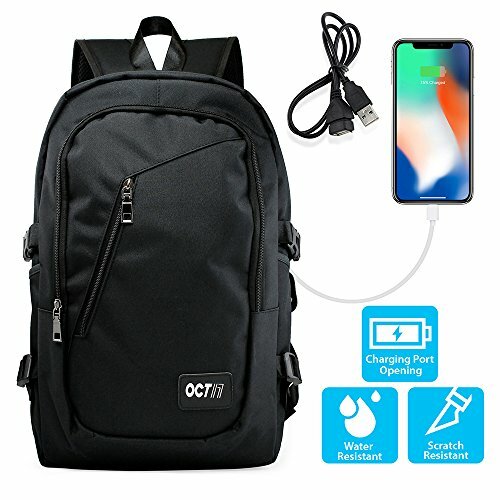 Whether you are in everyday occasions such as school, work, shopping, hanging out with friends, or doing outdoor activities like hiking, camping, traveling, backpacking, this multi-function getaway backpack with an external USB port opening and a USB charging cable adapter will make your experience more enjoyable and convenient then ever! Made with high quality and durable polyester material that's water and scratch resistant, it features a large spacious main compartment with double zipper closure to store your essentials. Within the main compartment, there is an open pocket with Velcro strap closure for laptops or tablets up to 17", and a small zipper closure pocket to store smaller valuables. There is also a small zipper pocket inside that has an external USB port opening which allows you to place the included USB charging cable adapter inside, leave your power bank in the backpack connected to it, then simply connect your own USB cable through the opening to charge your phone or other devices conveniently without struggling to keep everything together. There are 2 front pockets with zipper closure, one larger and one smaller for personal accessories and other necessities such as wallet, keys, cell phone, camera, cosmetics, etc. There are also 2 pockets on the sides, one with clasp strap belt and one opened, to keep water bottle, umbrella, or other small gears within hand's reach. To prevent shifting of contents inside the backpack, 4 adjustable straps are located on the sides for compression purposes or to attach bulky gears to the outside of the backpack. The two adjustable padded shoulder straps with breathable mesh fabric provide superior carrying comfort and convenience. With this backpack, you can now commute with ease and style! CONVENIENT DESIGN: Practical, elegant and versatile. Charge gadgets on the go with the external USB port opening on the side and the included USB charging cable adapter. Simply place the USB charging cable adapter inside the opening, leave your power bank in the backpack connected to it, and then connect your own USB cable through the opening to charge your phone or other devices conveniently without struggling to keep everything together. MATERIAL & UTILITY: Made with high quality and durable polyester material; water and scratch resistant; 4 adjustable straps located on the sides for compression purposes or to attach bulky gears to the outside of the backpack; two adjustable padded shoulder straps with breathable mesh fabric provide superior carrying comfort and convenience. CONTENTS: Backpack x 1, USB Charging Cable Adapter x 1.